While there is plenty of excitement around this whole moving deal, I'm a little sad we won't be able to put in a garden this season like we did last year. Between buying a house, trying to get the goods from MN moved and all the jazz that goes with this process, we have been way too busy to try and tend to a garden (let alone one we'd be leaving before being able to reap any of the benefits!). We had planned on adding to the berry beds and expanding upon the space where we placed our vegetables, especially to make room for more greens like Swiss chard and kale. Plenty of access to farmers' markets (thankfully, in both locations!) 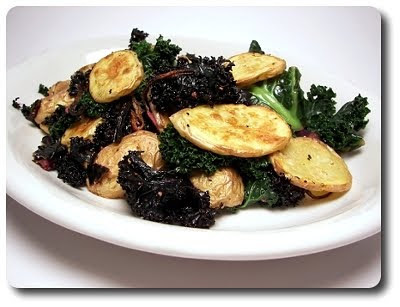 will just have to be the ticket for us this year, which is just where we went to pick up the greens we needed for this Kale and Roasted-Potato Salad we had recently. We'll get to what we did with the fresh kale in a minute, but the potatoes needed a bit of time and attention to prepare them. Using a handful of smaller potatoes, which need to be thinly sliced, along with a red onion while you have a knife and cutting board handy, we tossed them with enough extra-virgin olive oil to coat, along with plenty of salt and fresh ground black pepper. We used fingerling potatoes because we love how well they roast, but red bliss (or any type of "new potato") will do the job. To give the potato and onion slices plenty of surface space, we divided the mixture between two baking sheets and just made sure to rotate them halfway through the time called for. You might be able to finagle the pieces enough to fit on a single sheet, but it would be very snug with some probable overlapping. Giving them that real estate on the pan allows them to caramelize, burnishing them with a golden brush and adding a bit of crispness. With those two taken care of, we turned toward the bunch of kale we had, trimming the tougher stems away, then slicing the leaves into manageable pieces and giving them a good rinse. You'll want let most of the water you rinse them in drain away, but you don't need to run them through a salad spinner. In fact, you want to leave a bit of water clinging to the leaves which will help them cook through. Before adding the kale to the heated skillet, a large clove worth of thinly sliced garlic was slid into a drizzle of oil and left for a couple of minutes to crisp and turn golden. With the kale added and allowed to wilt down, a pucker-y dressing made from tart lemon juice, zest from said lemon we robbed the juice from and a small dollop of Dijon mustard was poured over and heated through. 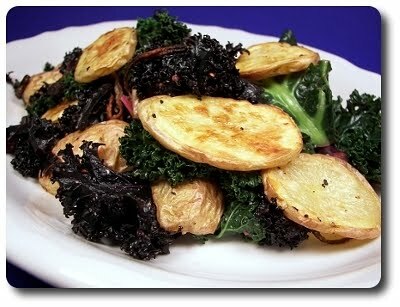 This salad was brought together by tossing the potato mixture with the kale, forming rather hefty servings once portioned out onto our plates. I liked how the potatoes were a little crisp on the outside, yet not hard like a potato chip - the insides were still moist and a bit fluffy. Mixing them with the heartier, but tender greens, coated in that tangy dressing, was a nice way to round out the dish, adding splashes of color, a decidedly bright contrast of flavor and a hint of natural sweetness. Simple, clean and a fantastic way to get in those fresh farmers' market finds! What happens when you marry a rich chocolate cake with a creamy, bittersweet chocolate chunk-studded cheesecake and downsize it into a hand held treat? 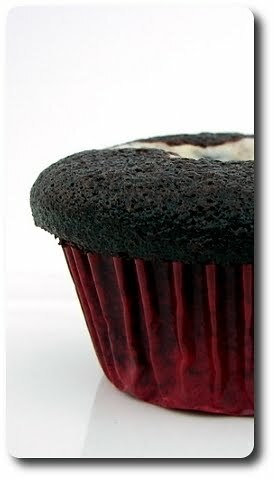 That would make these crazy good Black-Bottom Cupcakes! I made them today in honor of our final Weekly Wednesday Treat Day for Jeff's former co-workers in Minnesota (this will be his last week in the office here). 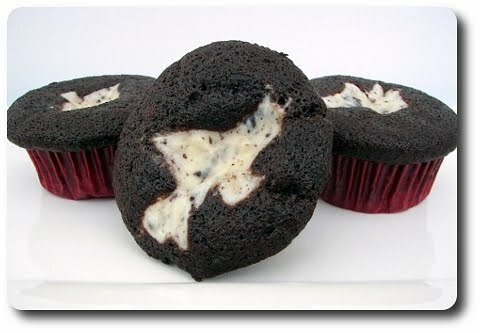 Smooth cream cheese, granulated sugar and a single egg form the magical filling to these cupcakes, along with a healthy handful of coarsely chopped bittersweet chocolate. You wouldn't necessarily have to add the extra chocolate if you wanted them a bit lighter, but it's like gravy on mashed potatoes - why not go for broke? With that set aside for later, the loose cupcake batter comes together in a snap, with the benefit of not needing a mixer! Yes, this devil's food-like cupcake is made much like a muffin, meaning there is no creaming involved - just a "stir-and-go" deal. While natural cocoa powder is used for a slightly bitter bite, I did throw a touch of espresso powder into the mix to bump up the chocolate feel. Not so much that you'd think "Err, should I be drinking this? ", but enough that it's like someone took a highlighter to the chocolate, emphasizing its more subtle notes. 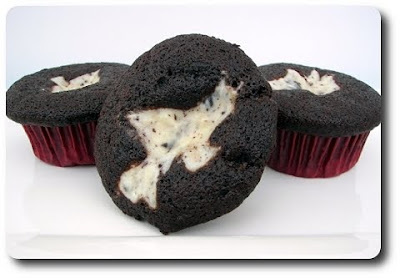 I would have expected white sugar to be used in the batter, but this recipe happens to call for brown sugar, which we found to bring extra moisture and depth to the cupcakes. As soon as I started filling the baking tin, I had one of those "oh crap" moments, thinking this is going to get messy. I thought the wells of the pan were already full after the chocolate batter was added, but as soon as the cheesecake filling was dolloped on, it quite frankly looked as if the batter was going to flow right out of the wells. Not that I could do anything now to fix it, so I decided I might as well throw caution out the window and whatever happens, happens. Much to my surprise, halfway through baking, I turned the oven light on to take a peek and let out an audible sigh of relief as I saw the batter perked right up and took shape, rather than oozing out all over. To make sure they have cooked through, a quick press on the dark cake-y part to see if it springs back will do - for added insurance though, you can slide a toothpick into the same area and look for it to come out mostly clean with a few moist crumbs attached. You would usually find a swirly mound of frosting on cupcakes, but there is definitely none needed here - with that snazzy cheesecake filling pulling its own weight, frosting would throw these out of balance and leave your sweet tooth begging for mercy. 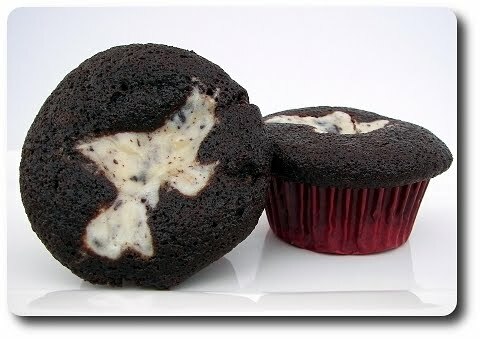 Also, with no frosting, transporting them will be a breeze! With the deadline fast approaching to get ourselves out to Charlotte full-time, I've been trying to be diligent on making sure nothing in the freezer goes to waste. I've used up most of the proteins I had stored, but I did find a heavy sack of shrimp that I had to find a use for. 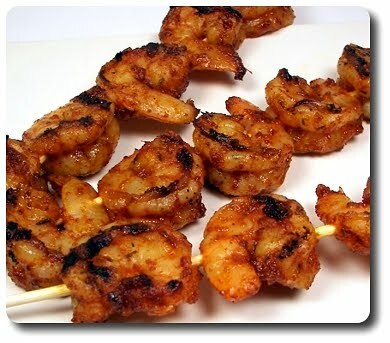 Since I've collected a fair amount of shrimp recipes over the years, I had plenty of choices to choose from, but it tends to get a bit overwhelming. Searching through the pile, many times I end up closing my eyes and randomly picking one instead. Which is exactly how I decided on making this dish of Jerk-Spiced Shrimp for dinner tonight! Equal amounts of granulated sugar and brick-red paprika are stirred together, along with salt, garlic powder, cayenne pepper, thyme and allspice, forming a homemade jerk-like seasoning used to coat the shrimp. Before tossing the shrimp with the medley of spices, we first drenched them in a few healthy glugs of olive oil for not only an extra boost of flavor, but this extra fat moistens the spices, allowing them to fall in all the nooks and crannies. As we were going to fire these on the grill, once we had them well coated with the seasoning, we threaded them onto long wooden skewers. You can soak the skewers first if you like, but I didn't bother since they weren't going to be over the heat very long. If you don't have an outside grill, a grill pan would work well, or even sliding them under the broiler to cook them through - just keep a close watch on them because they take minutes to cook. With a half teaspoon of cayenne, I was wondering just how much of a spicy bite they would have. They do have a definite punch of heat, but not so much it would clean out your sinuses - in fact, I'm sure Jeff would have liked a bit more power as it's usually not hot enough unless some tears start to form! 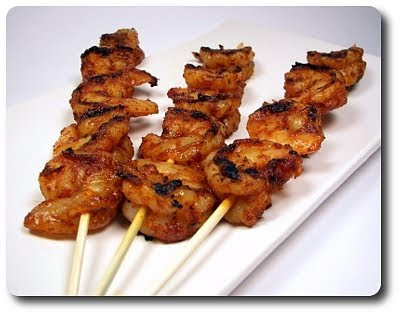 Jeff requested that we serve these charred, juicy shrimp over a simple plate of fragrant brown jasmine rice, but if you wanted to go a bit lighter, a refreshing fruit salad, perhaps loaded with plump chunks of tangy pineapple, would be the way to go (and have a beneficial cooling effect to boot!). You know how fond I've become of our precious whole-wheat pizza dough, so much so that I've almost stopped looking for other recipes to try (almost! I'm open to others!). As easy as it is to prepare, for this weeks Friday Night Pizza, we didn't haul out our food processor to make it, instead opting for a rustic, hole-y loaf of ciabatta bread we picked up from a local shop! 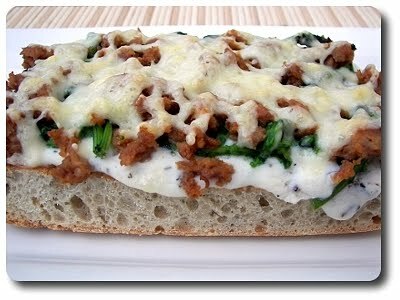 Even though we gained a bit of time by skipping out on making pizza dough, it was definitely eaten up with the preparation for these lavish Broccoli Rabe and Sausage Bread Pizzas. I don't mean to sound like it took all evening to make this, but there are a fair amount of steps and dirty dishes for a pizza! Broccoli rabe (which may also be called rapini in your market) tends to have a bitter quality to it that some people dig, but for us, it hasn't quite won us over. To draw a good amount of that out, we took our large bundle of greens, trimmed away the tougher stems and gave it a short three minute stint in a pot of salted (be generous!) boiling water. Drain away the water and once the greens have cooled a bit, press out any excess liquid so it doesn't leech out and sog the ciabatta. 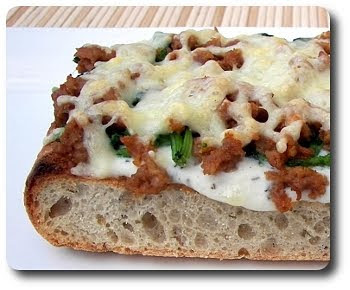 Even though these bread pizzas are baked once all the toppings are added, you'll want to give it a head start for a couple of reasons - the pieces will hold those additions better and it will keep a crunchier texture. This is done by taking the halved and split loaf, arranging the pieces on a rack set over a baking sheet and placed under the broiler. 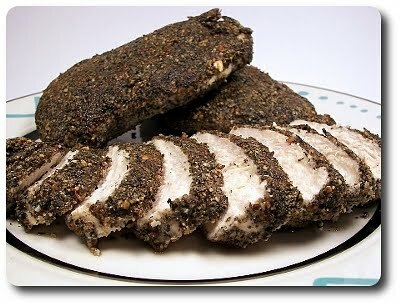 Don't walk away once you put this in as you can go from lovely toasted slices to blackened rocks in a manner of seconds! The rack may seem fussy, but this allows the air to flow all around the bread, keeping the bottoms crisp as well. For an extra dose of spice, I used about three links worth of hot Italian turkey sausage, which we browned and crumbled in a hot skillet, though sweet Italian would work just as well. To make use of the same skillet, we scooped out the cooked sausage, added a drizzle of oil and tossed in scandalas amounts of minced garlic (okay, so that may be a bit dramatic, but it sounded good!) to heat through. One hefty pinch of crushed red pepper is sprinkled into the garlic, making the pan ready to spice up those now not-as-bitter pieces of broccoli rabe. To give the greens a fancy note that makes you go "hmm, I can't quite pin point whatever that is, but I like it! ", we took a little nugget of nutmeg and added a few fresh grates of it in. Instead of slathering a red sauce on the bread, we thinned a cup of ricotta cheese with enough milk to give it a sauce-like consistency, then seasoned it with a few dribbles from our bottle of extra-virgin olive oil, lively fresh thyme, a touch of salt and plenty of fresh ground black pepper. 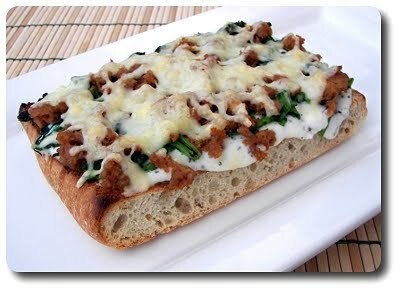 With that as a canvas on each quarter of bread, we divided the garlicky broccoli rabe over the portions, followed by the crumbled sausage and cheese of choice, shredded provolone! It takes just a couple more minutes under the broiler to melt the cheese and we were ready to dig in! With a crusty outside, this could just as well be a knife-and-fork pizza, but since the bread wasn't baked for any length of the time, the inside retains some softness, making it just as easy to pick up and munch on. Our loaf was on the larger side to begin with, giving us four monstrous servings, and we were plenty stuffed by the time we finished our quarters, but darn it all if I can't get the thought of attacking the leftovers tomorrow for lunch out of my mind! With our trips back and forth to Charlotte, baking has sadly been on the back burner and I've definitely been missing it. We have just about three weeks left before we physically pack up the household goods and permanently move out there - since Jeff still needs to head downtown to the same office for workspace, I figure there will be at least two (if not three!) more Wednesday Treat Days that I get to bake for! In these beautiful gems that we chose to make, Mexican Hot Chocolate Snickerdoodles, lies a couple surprises that one might not guess at first glance. The dough is not only ridiculously simple, but only requires a couple bowls, a whisk, a sturdy wooden spoon and a few measuring devices to complete. 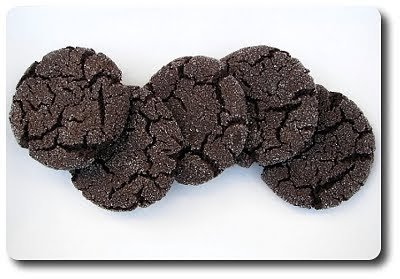 Our cookies are fairly dark thanks to the use of Dutch process cocoa powder - you could use natural cocoa, but we've come to prefer the former as it tends to lend a more complex chocolate background with a smooth finish. The recipe did call for using chocolate extract in the wet ingredients, but that's one ingredient I didn't have in the pantry and wasn't about to buy a bottle for a teaspoon. If you do happen to have one though, replace one teaspoon of the vanilla with it. When combined, the dough was firm, yet pliable, and was not crumbly nor sticky in the least. Rolled into walnut-sized lumps, you can divide the dough out in a few ways to get the 24 cookie yield. You could divided the big ball of dough in half, then divide each in half again, leaving you with four pieces. Divide each fourth in half once more, then you'll just need to evenly break each lump into three pieces. If you'd rather go the route of the trusty cookie scoop, a tablespoon size worked well, packing it tightly without leveling it off. If you want to go crazy, break out the scale and divide the weight of the dough by 24 - our dough balls ended up being about 30 grams each. Flattening each ball of dough into a thick disc, we pressed the tops of each into a dish filled with sparkling cinnamon sugar. 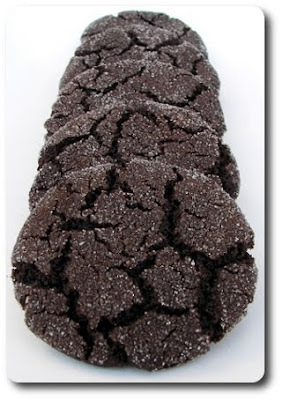 Baked until the cookies are just set and have developed those attractive cracks and crevices over the top, resist the urge to try and remove them from the hot baking sheet. Right out of the oven the cookies are on the delicate side, but letting them sit for five minutes gives them time to firm up and make for an easy transition to the cooling rack. Now, back to the surprises I mentioned earlier... when Jeff got home and took a look at the cookies he said "Oh, chocolate cookies! I need to try one now... please!" Before I even had a chance to say go ahead he took a big bite and went "Oooh, fancy, a cinnamon twist!". Then, his eyes opened wide and I said "Let me guess, you found the secret... hee hee!". After you roll the cookie over your tongue and swallow, you'll feel a slow, but pleasant, burn start to crawl up your throat from the dose of spicy cayenne pepper. Between the granulated sugar and maple syrup in the dough, the sweetness definitely tempers the heat, but there is just enough bite left to notice. The cookies do have a somewhat crunchy feel to the outside from the crisp sugar-y crust, but they are actually on the softer side with an addicting chewy quality to them. The final surprise? 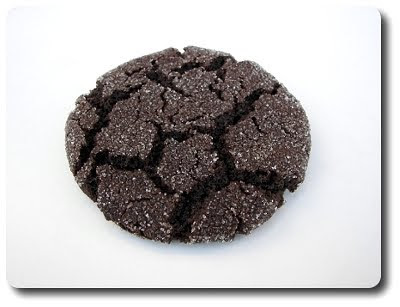 The cookies are vegan - yup, no eggs or dairy products (as long as you use soy or almond milk)! The granulated sugar does pose a question as to them being truly vegan (depending how one defines), but as long as you use beet sugar, your fine. If you are using cane sugar (or frankly, just don't know because it isn't always labeled), during the refining process, this sugar is filtered through activated carbon, which could likely be charcoal from animal bones. However, I believe that none of that will actually reside in the final sugar product, hence the quandary for some vegans! Beet sugar doesn't need to go through that process, along with several other types of less or unrefined sugars that you could try to use. I tend to buy two or three of those giant packs of chicken breasts from Costco and spend a morning breaking them down into individual smaller pieces (that is, when we're not getting ready to move!) 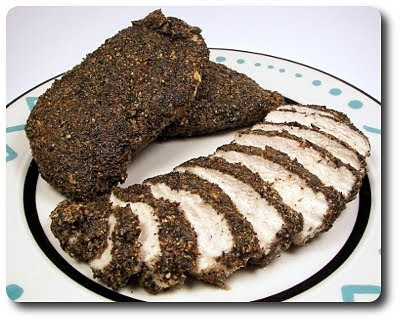 - part of it I grind with dark meat and freeze into one pound discs, with the rest being divvied up into four and six ounce portions. I like to freeze those by themselves first, then pack them together and pull out just what I need without having extra to worry about. Being pulled out in singles allows them to thaw in a snap and makes for speedy dinners without much pre-planning, which is just what I needed after having tonight's dinner plans change and switching the main protein to this Egyptian-Spiced Chicken instead. The title "Egyptian-Spiced" comes from the blend used to coat the chicken called dukka (or dukkah), which typically contains some sort of nut, cumin and sesame seeds, along with an assortment of other spices. This mix uses sliced almonds for the nut, with coriander seeds, fresh thyme and black peppercorns standing in for the other spices. To bring out the natural richness in a few of the ingredients, we first toasted the almonds, sesame seeds, cumin and coriander in a dry skillet until lightly golden. Being fairly chunky, the mixture does need to be broken down to coat the chicken evenly - we accomplished this with a small coffee grinder we keep just for spices, but a plain old mortar and pestle, with a little muscle, would work too. Just be sure to let it cool slightly first either way. If you just sprinkled the mixture over the chicken, certainly some of it would adhere, but a fair amount is likely to fall off to the side. To allow it to grab hold and give the chicken a deep crust, we dunked each in a beaten egg, seasoned it with salt and then ran each piece through the almond mixture. The salt is added here, rather than blended in the spice mixture, giving you the control on just how much you want to add to each chicken breast. You don't need a lot, just a sprinkle to pop the robust nature of the nutty coating. To cook the chicken, we quickly seared it in a skillet to brown both sides, then slid the pan right in a moderate oven to finish the pieces through with a gentle hand. Ours were done in just about ten minutes, but it could be slightly less or more depending on how much heat the skillet had and your oven - it's best to use a meat thermometer so you can pull them out just as they are done (I'll usually pull breast meat out around 160 to 165 degrees as the temperature continues to rise slightly as they rest). Moist and tender, Jeff and I both thought this was an interesting result - while it wasn't like a thunderous explosion of flavor, we enjoyed how well the spices, nuts and seeds worked in a cohesive manner with each other, yet we could still pick out the individual ingredients. The almonds were nice, but fairly subtle in the end - I'd love to try this again using a more poignant nut... perhaps hazelnuts or even pistachios. We're now back in Minneapolis, once again, after a 23 1/2 hour drive over the past two days (which is why we've been quiet on the website!). With that, we finally have some news to share! Thanks to our brilliant agents, Lori in Minnesota and Melissa in North Carolina, we have accepted an offer on our house here, and have also had an offer accepted on a house in Charlotte! This all happened within roughly a 24 hour time period, which is amazing timing. We have about three weeks to get things wrapped up in Minnesota before we will be moving full time to Charlotte. It's going to be a jam-packed three weeks for sure, but we'll do our best to keep the recipes flowing as often as we can because we need to eat too! *Quick note - did you see we now offer clean, print-friendly recipes? If you haven't had a chance to check out the post with details, click here! 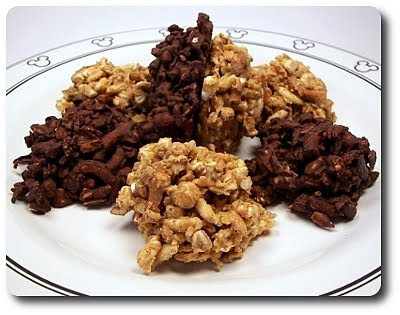 I was telling Jeff the other week about a no-bake "cookie" that my Mom used to make when us kids were growing up - I think they were called haystacks. They were basically those crunchy chow mein noodles mixed with plenty of melted chocolate, butterscotch chips, sometimes peanut butter and I think there might have been some sort of nut thrown in there, but it's been forever since I've had them. 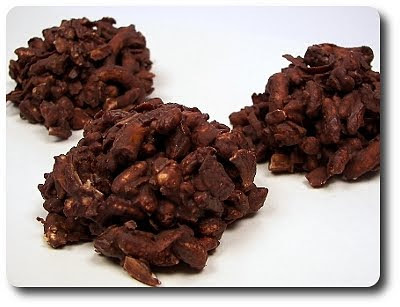 I couldn't get them out of my mind and figured we'd give them a try, but with a bit of a makeover and we ended up with these Chocolate and Peanut Butter Pretzel Haystacks. To retain the crunch and bulk of the chow mein noodles, without actually using them, a combination of whole-grain puffed cereal (bulk) and broken pretzels (crunch) (sticks or twists work best) were tossed together, along with shredded coconut for sweetness and chopped toasted almonds. Since I was looking to play around with the flavorings, once that mishmash of ingredients was merged, we divided them evenly between two bowls. For the first set, we melted about a cups worth of chopped bittersweet chocolate, then stirred in natural almond butter (homemade!) and zapped it for a few more seconds in the microwave to meld the two together. 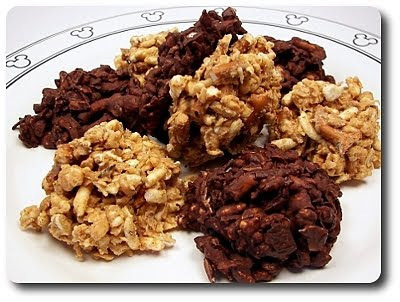 The chocolate mixture was smooth and pourable, which made it a breeze to mix in with the puffed cereal concoction. Two tablespoons worked well to divvy the mixture out onto a baking sheet if you want to keep your hands clean, but I ended up using one spoon after the first two or three - a little messier, yes, but then I got to lick my chocolate-y fingers clean when I was done! For the next batch, I went the peanut butter route, using peanut butter chips and natural peanut butter. These chips don't tend to melt as nicely as chopped chocolate, but as soon as we added the peanut butter and gave it another jolt of heat, I found the added fat from the nut butter helped smooth it out. It was a bit stiffer than the chocolate version and I found I had to work a little harder to get all the cereal and pretzels coated with it, but it worked together in the end. If you want to up the peanut quotient, you could swap out the almonds in the dry ingredients of this combo for chopped peanuts, but I didn't think that far ahead. I imagine butterscotch chips would work just as well as the peanut butter chips here, using either the almond or peanut butter. 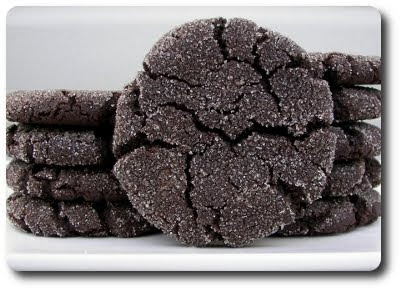 To firm up the cookies, a quick rest in the refrigerator did the trick - I found the coating stayed set at a cool room temperature, but if your kitchen runs especially warm, you may want to keep these in the refrigerator or even the freezer. Both of us were wondering how the coconut would end up working in these - happily, we found it added more of a textural chew with a very subtle coconut note. If you would like the coconut to be more pronounced, you could try toasting the shreds first. I quite liked both versions, but found myself reaching for the peanut butter mounds while Jeff ran towards the chocolate/almond (no surprise there!). 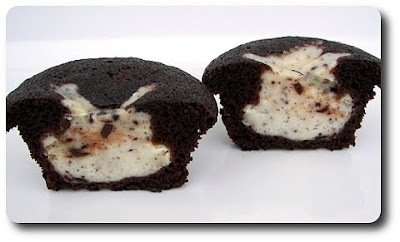 Both of us, however, loved the war between the sweet and salty notes in these, a top flavor contrast for us! I was about to post another new recipe, but we'll push that off until tomorrow as I have some long-coming news to share! I think we've finally nailed the code (thanks GreenLava!) to produce print-friendly recipe pages without having to re-direct you to another website or change the individual posts over to PDF files. There may be a tweak or two left to do, but the changes are now live! Now, when you go directly to a recipe post, you'll be able to print the text of the recipe (minus any website formatting, sidebars or pictures) without having to copy and paste the information to another program. If you want to see what will print before you try it out, just select print preview and give it a look! I know you've been asking for this for quite some time now - thank you for being patient! Please send us a note if you find any issues with the process. I don't know how we lucked out, but the weather for this Charlotte trip has been exceptional, if not a bit on the warm (hot!) side. Today was close, if not over, 90 degrees, but boy did it feel good with a strong breeze! I've been completely taking advantage of this while Jeff is at work, walking Gus around all sorts of groovy trails and shaded walkways. We have plans to go through a few houses this weekend, while also keeping an eye out for some sort of temporary furnished housing when we come out (close to permantely! ack!) next time. 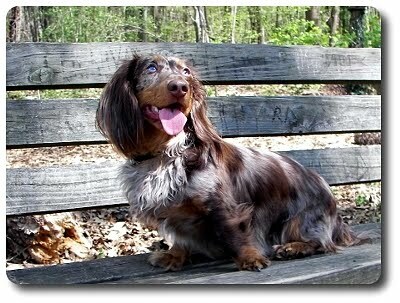 This past weekend, Jeff and I took Gus around a lovely area called Freedom Park. Now, while you're here, I do have food to share that we made after we arrived back home from the last trip. Do yourself a favor and make this one, soon. 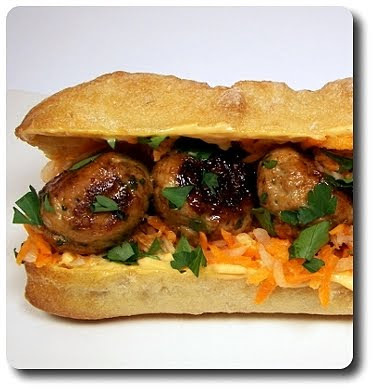 Pork Meatball Banh Mi - doesn't the name alone just sound exotic and intriguing? Maybe it doesn't to you, but it did to me! I mean... meatballs - what's not to like? And pork... come on! Banh Mi did have me stumped though, but this is what I gathered after looking around - think a hearty Vietnamese baguette (which if you were staying true, the bread would be made with both wheat and rice flours) sandwich that can either be made using specific unique ingredients or tossed together using leftovers languishing in the refrigerator - aka a kitchen sink sandwich. I didn't make many changes to the ingredients for this sandwich, but if you compare it to the original recipe, it may look fairly different. I thought it was written a little haphazardly and out of order; hopefully the way I posted works out a bit better for you. I made this from start to finish the night we had it for dinner, but you could get a head start on some of the components a day or so head of time - I'll let you know what parts when we get there. Sandwiches usually have some sort of spread for not only flavor, but moisture and to help hold the ingredients together - in this case, an snappy combination of mayonnaise, a couple green onions and one of our all time favorite ingredients, sriracha (hot chili sauce). You'll want to make this first, giving it time to hang out in the refrigerator to settle as you prepare the rest of the sandwich - feel free to knock this out of the way a day or two ahead of time. Next up for this sandwich is a quick batch of pickled vegetables - carrots and daikon in this case. If you absolutely can't find daikon (a milder white radish) you could try using regular red radishes (though they have a bit more bite). 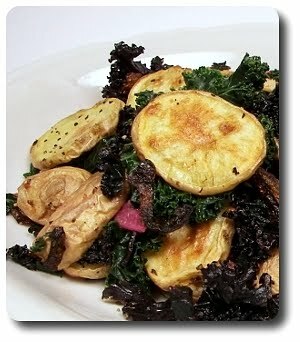 If you are not keen on any type of radish, think about using a crisp cucumber instead. After grating the vegetables, they were tossed with the pickling mixture mixture made from rice vinegar, sugar and salt, then left to sit for an hour while you get your hands dirty with the homemade meatballs. For the best texture, I would suggest waiting and doing this before serving if possible - we weren't as fond of it the next day as we thought the vegetables got a bit too soft. 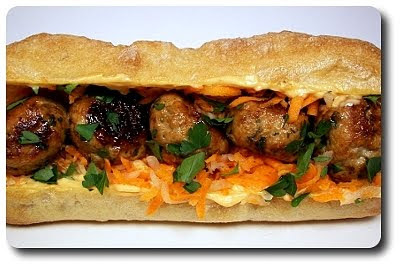 Lean ground pork, vibrant fresh basil, ample amounts of fresh garlic, pungent fish sauce, more of that fiery sriracha, a small scoop of sugar, cornstarch, salt and fresh ground black pepper form the meatball mixture. Rolled into trim tablespoon-sized balls, we cooked the entire batch in one of our largest skillets heated with a dose of brawny toasted sesame oil. You could ditch the skillet and bake them through in the oven if you don't want to deal with that, but I think I'd miss the rich crust the skillet gave them. You can take advantage of making these ahead of time - just keep the raw meatballs in the refrigerator, covered, for a day or so and cook them just before you're ready to eat. With a few crusty rolls in hand to use as the vessel to bring all those ingredients together, I do suggest scooping out some of the fluffier insides to make plenty of room to stuff the fillings in. 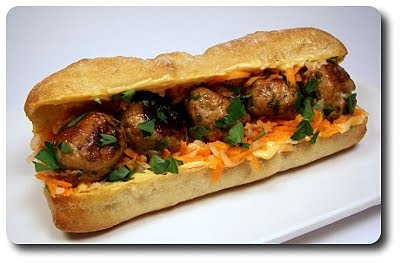 With a bit of fresh cilantro to finish the assembled sandwiches, the juices in my mouth were flowing in anticipation of taking my first giant bite! The juicy meatballs themselves were crazy addicting, along with that zesty mayo that challenged our heat-tolerance. I loved the sweet-tanginess of the pickled vegetables - the one thing I wish I would have done differently was how they were prepared. Next time, I think I would cut them in matchstick-sized pieces rather than grating them. They weren't mushy by any means , but we would have liked the firmer contrast with a thicker cut. 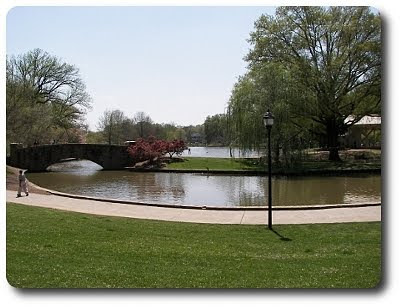 Once we arrived back home from the last Charlotte trip (I'm playing catch up as we're back out here again - crazy, right? ), we were still pretty wiped, even after a day at home... however, we still needed to eat! Fairly effortless, comforting and in the process of making it, not trashing the kitchen, was what dinner needed to be. 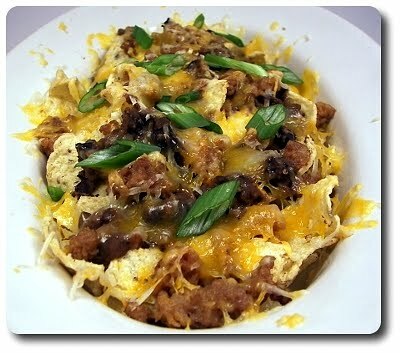 After gathering together recipes for the week last Sunday, I came upon a recipe for Spicy Sausage, Bean and Cheese Nachos that looked good enough to be called dinner Monday night. Removing the casings from a pound of hot Italian turkey sausage was first on my list to do, giving me direct access to brown and crumble the meat into bite-sized pieces. With the crumbles being scooped out of the pan to drain, whites of a few scallions were next in line, along with plenty of chopped fresh garlic. The heat in the skillet almost immediately sends their fragrant aroma right to your nose, letting you know it's time to stir in the black beans, broth, chili powder and cumin to warm through. With the help of a potato masher, we changed the look of this mixture by smashing most of the beans, leaving a few stragglers behind, to give us a chunky-smooth texture. A wooden spoon would get you the same result if you are lacking the tool we used, though it may take a bit more time and effort. 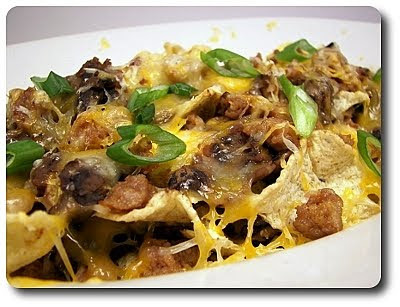 To assemble the nachos, we divvied half of the total amount of tortilla chips we were planning on using between six individual baking dishes, then did the same with the bean mixture and the two cheeses we were using - pepper Jack and sharp cheddar. Repeating the process builds a generous stack for each portion, readying them for a trip in the oven to heat the chips and melt the cheeses into a gooey delight. Serving this family style would work just as well too - use a large oven-safe serving platter (a parchment-lined baking sheet would be fine) and follow the same process, making two layers in total. As mentioned, I used hot Italian turkey sausage - if you don't groove on spice, try swapping this out for the sweet version for a more herb-y, mild experience. You could, if you prefer, use pork sausage, but both of us felt the leaner turkey stood its ground and worked well here. We didn't add any other toppings (and frankly, didn't miss them), but if you find your nachos are naked without some, a few spoonfuls of salsa and a hefty dollop of sour cream might be in your future!